The Rite of Christian Initiation for Adults (RCIA) and Rite of Christian Initiation for Children (RCIC) bring adults and children over the age of 7 who have not completed the Sacraments of Initiation into the Catholic Church, or complete their initiation. 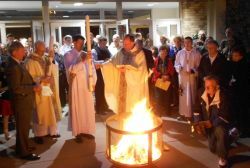 The process begins in September and culminates with the reception of the sacraments at the Easter Vigil. See Faith Formation for more information. Contact the Faith Formation Office at 585-338-1146 if you are interested or have questions.